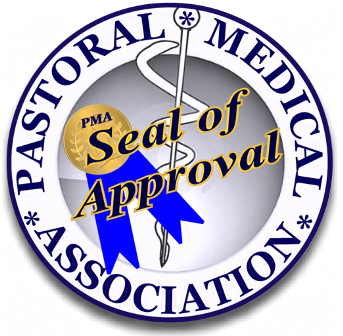 ​Practitioners of Pastoral Science & Medicine offer health improvement and counseling services based on a ministerial license issued by the Pastoral Medical Association (PMA). The title D.PSc referenced on this website relate to practitioner’s PMA license, and not to any state license authority. All health and health-related information contained within this JA Health Advocate Web site is intended to be general in nature and should not be used as a substitute for a visit with a health care professional. The advice is intended to offer only a general basis for individuals to discuss their medical condition with their health care provider. Your health care provider should be consulted regarding matters concerning the medical condition, treatment and needs of you and your family. Although every effort is made to ensure that the material within this site is accurate and timely, it is provided for the convenience of our members, under the Pastoral Medical Association, and should not be considered official. JA Health Advocate practices ONLY under this Pastoral Medical Association license TO MEMBERS ONLY. We utilize only Natural, Biblical approaches of care to our members. All information on this website as well as information in an published materials is NOT for treating purposes. Please consult your doctor or responsible clinician for care. Anyone desiring to receive care through JA Health Advocate must become a VIP Member... Please click the Register Link at top right of this page to request VIP Membership Immediately. To access support directly from JA Health Advocate, you MUST be a VIP Member as we practice under a Membership ONLY License. Thank You.